2 Dead After Carjacking, Police Pursuit in Conn.
Two men have died after a car crashed into the Congregation Beth El Keser Synagogue at 85 Harrison St. early Monday morning following a police pursuit, according to New Haven police. Police officials told NBC Connecticut that the incident began as a carjacking in the area of Fitch and Blake Streets after one man showed the victim a simulated weapon beneath his clothing at around 12:15 a.m. The owner of the car, Heath Klarsfeld, said he was stopped at a red light at the intersection, when the pair approached him. He said one of them claimed to have a gun. "I knew something was a funny as soon as he was getting a little too close and then his friend was going around the back side," said Klarsfeld. "I went to go lock my door and they opened it really quick." Police say Klarsfeld of the carjacking was not injured. At around 1:35 a.m. an officer spotted the stolen vehicle, a 2005 Toyota Highlander, in the area of Whalley Avenue at Winthrop Avenue police said. According to police, the officer attempted to stop the vehicle but lost sight of it. The car was then found crashed into the synagogue, police said. 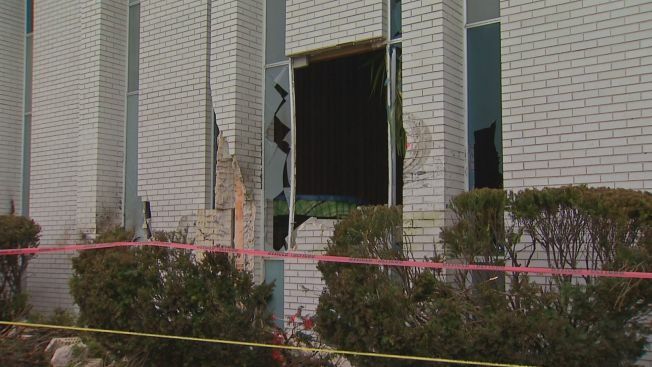 The synagogue sustained minimal structural damage while the stolen vehicle sustained heavy damage, according to police. No one was inside the synagogue at the time of the crash. Police said one man was dead upon arrival on scene while the other was transported to the hospital where he later succumbed to his injuries. State police have identified the men as 23-year-old Tommy Brown of New Haven and 20-year-old Andrew Bolden-Velez of West Haven. Per standard procedure, New Haven police turned the case over to Connecticut State police who are continuing the investigation. Whalley Avenue was closed near Phillip Street for hours while police investigated but has since reopened.